The 'Wedding on Wheels' - the most inspiring love story of 2018! Some love stories touch our hearts, keep us thinking about it and give us happy tears! 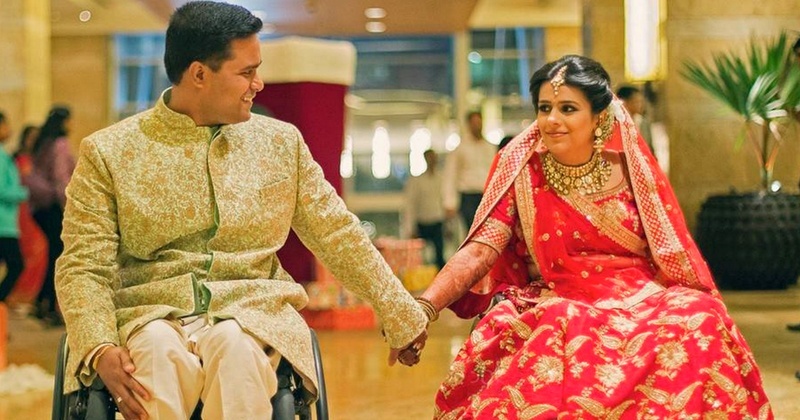 One such story is of this differently-abled couple - Anup Chandran and Nehal Thakkar. This ‘Wedding On Wheels’ as their photographer - 361 Degree Productions likes to call it, touched our hearts too! Anup and Nehal come from different states and totally different cultures. Anup is a South Indian whereas Nehal belongs to an orthodox Gujarati family. But they were destined to be together! In 2003, Anup met with an accident in which he lost his legs, 2 years down the line, Nehal met with an accident at the exact same place. Coincidence, serendipity or fate? A common friend introduced them for the first time and they developed an instant connection! From Orkut, to Facebook, to playing Farmville (where Anup used to cheat in order to win :p), they never knew how and when they fell in love! It took them seven years to convince their respective families, and they never gave up on each other however hard the situation got! Venue : Grand Hyatt, Mumbai.